His father and grandfather were born in the region of Namslau in former Upper Silesia. In this tweet, he made a joke about his Eastern Euro heritage, explaining why he stole so much in his youth. It's nice that Living DNA has updated its Polish regions. I can only add that I tried to keep the number of regions rather small. I think that 15 regions is enough. But if we wanted, we could distinguish many small sub-regions within each of these 15 regions. *Polish Gorals can be further divided into smaller subgroups. **Both Silesians and Kashubians can be further divided into smaller sub-groups. ***We can distinguish many ethnographic/regional groups among East Germans. Last edited by Tomenable; 02-02-2018 at 05:43 PM. Surnames typical for Germans of Kosznajderia (Koschneiderei) region: Rhode, Panske, Senske, Rink, Pankau, Schwemin, Semrau, Latzke, Patzke, Janowitz, Wollschläger, Risop, Behrendt, Musolf, Nelke, Weinland, Papenfuss, Gersch, Brauer, Schreiber, Thiede, Theus, Gatz, Hoppe, Kuchenbecker, Scheffler, Schwanitz, Klinger, Schmelter, Warnke, Rosentreter, Isbaner, Fethke, Ruhnke, Folleher. Some of those are Slavic surnames. Which is weird considering that Koschneiders originally came from the Osnabrück region in Lower Saxony and Westphalia. Apparently they assimilated local Slavic population, which Germanized its surnames. Gottschalk is an etymological German first name. Gott = god, Schal(c)k = servant. 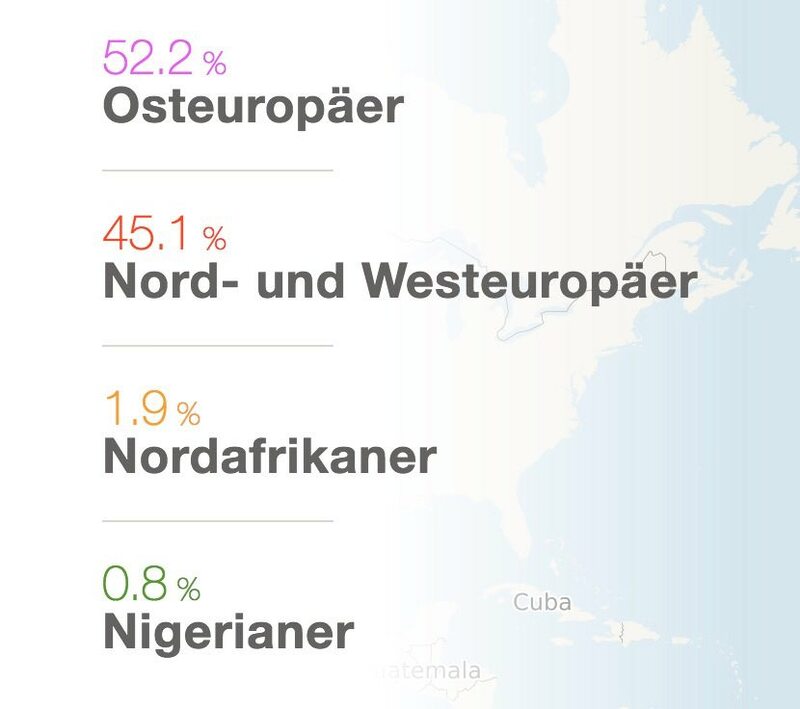 The Nigeria a some sort of MyHeritage bug. Almost everyone gets some 0.6-1.5% Nigeria who uploads the latest 1 1/2 month. Last edited by rothaer; 02-13-2018 at 03:23 PM. Fully agree with the names. I think it´s just this first German settlement is known and then it´s not looked at what happened the next 400 years. And, of course there must have been a local Slavic population, at least in direct neighborhood. Also, depending on when they came, they did maybe not have any surnames at arrival. Last edited by rothaer; 02-13-2018 at 03:35 PM. It is hard to determine, if they already had fixated family names at that period. I tend to say yes. The mayor (Dorfschulz) of Cekzin - this is one of the villages - came from the village of Schwemmin close to Köslin in Pommern in 1342 and got the family name Schwemin. This family name was kept, but it seems to partly have changed to Szweminski in the mean time. Here you see some more names. However this indicates the Osnabrück people were far not the only in Koschneiderei. Last edited by rothaer; 02-14-2018 at 08:26 AM. They weren't originally considered German though. Traditional German concepts of Germanness (German ethnicity and nationality) were based mostly on Muttersprache - and were different than concepts of ethnicity and national identity developed at the same time in Western and South-Western Europe (for example in France and Italy, language was not an important element of Frenchness and Italianness, although Standard French and Standard Italian languages were eventually developed). The French concept of ethnic French people, or people who should identify as French, included groups such as Bretons, Alsatians (German-speakers living in France), Basques and Occitans, etc. But the German concept of ethnic Germans excluded groups such as Non-Germanized Sorbs. Most of Central European, Eastern European and Balkan nationalist movements adopted the German way of thinking - rather than French or Italian - and also based their concepts of Polishness, Hungarianness, Serbianness, etc. on mother tongue. "(...) "(...) German history is also commonly understood as a national history, as the history of a national community enduring across centuries, held together by a more fundamental association than the often very loose bonds of political confederation. "German-ness" is in this view a characteristic of a national community rather than institutions, emerging through a collective awareness of the possession of a shared language and history. Nationalists readily concede that we cannot take for granted that a given population is possessed of any such collective identity - the necessity of drawing out a population's "national consciousness" is the first point in any nationalist programme. But this assumes that the consciousness is simply latent, implicit in the sharing of certain essential experiences. Historians are obliged to examine critically such claims to historical community, and consequently the possibility of talking about a "national history" in Germany. We must investigate the extent to which "Germans" understood their experiences in shared terms, and the extent to which these experiences were distinctive from that of "non-Germans". Central to the German understanding of national identity was language. Native possession of the German language identified a person as “German” as opposed to “French”, “Polish” or “Italian”, and bound them to a German national community stretching from the Tyrol to Holstein and from Alsace to Prussia. Philosophers of nationality such as a Johann Gottfried Herder understood language as a tangible expression of shared experiences and ways of thinking, and believed that certain syntactical and semantic characteristics could be identified across regional dialects which identified their speakers as possessed of Germanness, of values and patterns of thought distinctive to Germans, and distinguished them from non-speakers and non-native speakers, who correspondingly possessed their own distinct “national” characteristics. In practice, however, these dialects were diverse often to the point of mutual intelligibility in their spoken form; it is unlikely, when Herder wrote in the late eighteenth century, that for example an Austrian and a Rheinlander could comfortably carry on a conversion in their vernacular dialects. What allowed individuals of diverse linguistic backgrounds to identify themselves as “German” was shared reference to literary dialect of High German. Although literary forms of German had existed since the Medieval period, the emergence of a single, shared written language was a product of the print revolution of the 16th century. The newfound ability to produce documents with unprecedented speed and cheapness allowed the emergence of a mass reading-public, which in turn contributed to the decline of Latin as a standard literary form. The historian of national identity Benedict Anderson describes how these developments encouraged a localisation of perspective in European literature, in part because so much of the new reading public was comprised of people with geographically more limited perspectives than the nobles and clerics who had formerly dominated European literature, but also because the assumed reading public of a text was no longer the universal Catholic church, sprawled across Europe and with outputs across Asia, Africa and the Americas, but a specifically “French”, “English” or “German” publics, tied to particular regions of Europe. At the same time, however, this typically meant a broadening of perspective on the part of individual readers, as the use of standardised written forms used across large areas both obliged and allowed readers to imagine themselves as part of a community of readers extending beyond the traditional horizons of the local district. This collective experience as readers, engaged in a shared literary and cultural discourse, encouraged Europeans imagine themselves as sharing more than just the printed page, but common patterns of life and ways of thinking. A reader could begin to think of themselves not simply as a Frankfurter, Berliner or a Bremener, but as a “German”. The Protestant Reformation here emerges as a crucial touchstone for proponents of German national identity. The dissemination of a shared written German in the 16th century owed much to the rapid dissemination of the writings of Martin Luther, above all his translation of the Bible into German, which made use of a High German dialect typical of Upper Saxony. Leopold von Ranke, the great 19th century historian, shares Anderson’s attention to the relationship between a reading community and national identity, albeit in an inverted form, and discusses the German Reformation as the first entry of a self-conscious Germany into European history. By producing a body of high literature that was both particularly German and broadly German, that was both written directly into German (rather than as vernacularized Latin texts) and expressed extra-local concerns, Ranke argues, the early Lutheran movement brought into being a self-conscious German literary community, uniquely capable of speaking on behalf of the German nation. In practice the religious fissures of the Reformation do not break down along the “national” lines imagined by Ranke, with around half of Germans remaining Catholic, and many adopting non-Lutheran Protestantisms such as Calvinism and Anabaptism, fracturing much of popular “German” print culture along confessional lines. Particularly problematic for proponents of German nationhood, the Calvinists of the Netherlands possessed a strong and independent print culture in the local Low Franconian dialect, which paid little reference to High German print culture or its Lutheran canon. The lack of any non-arbitrary reasoning by which Dutch could be excluded from “Germany”, while speakers of Franconian and Low Saxon dialects more closely related to Dutch than to High German regarded as unambiguously “German”, sheds light on the often-flimsy distinction between “language” and “dialect”, and the extent to which it was informed by political aspirations, rather than, as in the nationalist ideal, the reverse. This became particularly pointed when addressing Germany’s sizeable Ashkenazi Jewish minority, the majority of which spoke either local dialects of German or Yiddish, a dialect of Rhenish High German written using the Hebrew alphabet, which in strictly linguistic terms would make them as “German” as any other speaker of those dialects , yet even liberal German Christians would often insist that Jews continued to form a distinct “Jewish nation”, geographically co-existent with “Germany”, but culturally insoluble to the extent it remained attached to a distinct identity and religion. What emerges here is the endurance of local or sectional identities, robust despite the contempt of proponents of a shared German nationality. The Dutch example is the most pronounced; while some German writers imagined a Germany stretching from “the Meuse to the Memel”, encompassing the Netherlands (as well as the Franconian-speakers of the duchies of Limburg and Luxembourg), the stubborn refusal of the “Netherlandish Germans” to see themselves as such forcing acknowledgement of a distinct “Dutch nation”. None the less, regional patriotisms continued to wield considerable influence elsewhere in regions identified as unambiguously “German”. Nationalist festivals are well known as focal points for emerging German national identity, but regional festivals proliferated in the same period, celebrating local traditions, regional identities, and loyalty to ruling dynasties. The first major regional festival, the Cannstatter Volkfest held in 1818 near Stuttgart by Württembergish patriots, attracting almost thirty thousand people, as many as the much-celebrated nationalist Hambach Festival of 1832, while by the late 19th century, the Wittelsbach-sponsored Munich Oktoberfest would regularly attract visitors in the hundreds of thousands. New editions of classic texts emerged which presented counter-nationalist accounts of their authors, such as a complete edition of the works Gottfired Wilhelm Liebniz presenting him as a Hanoverian rather than German philosopher , while Saxon commemorations of Martin Luther emphasised his personal ties to the House of Wettin and the particularly Saxon dialect of his writing. Particularist patriots made use of a vocabulary and symbolism consciously parallel to those of German nationalists, espousing loyalty to the Saxon or Württembergish “Fatherland”, or rivalling “Germania”, the feminine personification of the German nation, with local variants such as “Bavaria” or “Hammonia”. (p.268) In Saxony, the Wettin kings began to replace the traditional style of “Wettinfürst” (“Wettin prince”) with “Sachsenfürst” (“Saxon prince”), echoing nationalist calls for a “King of Germans”. In the far South-West, German-speakers of Switzerland remained resolutely attached to their independent, multi-lingual confederation, oblivious to Romantic salutes to the “Land of Tell” as an integral part of the German homeland. The romantic writer Heinrich von Kleist, although himself a nationalist, acknowledged the contradictions of identity found in 19th century Germany, imagining a young nationalist confronting his father with an assertion of German nationality, and the father’s indignant reply that the son was born in Meissen and is therefore a Saxon, tartly observing that this mythical land of “Germany” can be found on no map, and its people in no census. The persistence of regional and state identities becomes most pointed when we look at ethnic non-Germans living under states dominated by ethnic German rulers, particularly in Hohenzollern Prussia and Hapsburg Austria. To speakers of Slavic languages, who predominated on the Eastern edges of the German Confederation, participation in a German national community often held little attraction, but this did not mean that they would default automatically to a competing ethnic nationalism. In Prussia, loyalties tended to develop along confessional and traditional rather than ethnic lines. For the Lithuanians and Masurians (Polish-speaking Protestants) of East Prussia, loyalty to the Lutheran Church and Prussian crown took priority over ethnic solidarity with Catholic subjects of the Russian Tsar. They were able to call upon their historical ties to the ducal crown of Prussia against German prejudice, arguing that they were not only on an equal footing with ethnically-German Prussians, but that as loyal Staroprusaki (“Old Prussians”), they had priority in the state over the newly-Prussian Germans of Hanover, Westphalia and the Rhineland, unreliable newcomers whatever language they happened to speak. Similarly, the Sorbs of Brandenburg and Kashubs of Pomerania, Lutherans and subjects of Prussia-Brandenburg, regarded themselves as unambiguously “Prussian”, invoking old loyalties to the “Duke of Cassubians and Wends” , in spite of their ethnic ties to the Sorbs of Saxony and the Kashubs of Royal Prussia, Catholics and (until the Partitions) subjects of the Kingdom of Poland. (...)"
4. Azar Gat in his book "Nations: The Long History and Deep Roots of Political Ethnicity and Nationalism" mentions five groups - the English, Danes, Portuguese, Hungarians and Poles - as examples of the oldest "ethnic nations" in Early Medieval Europe. Germans however - according to Gat - became "one entity" only later, in the Middle Ages there was rather a continuum of many West Germanic ethnicities, which included also ancestors of what became the Dutch people, and the Flemish in Belgium. But I'm aware that many German nationalists in the 1800s-1900s counted the Dutch and Flemings as parts of the German nation too. The general idea is that the Dutch were originally ethnic Germans, but later split from Germans and became a group on their own. Last edited by Tomenable; 02-27-2018 at 04:31 PM.